Goldenbook and Refrigerator Deluxe have become two of my most popular type families in recent years. The last couple of months I’ve been working on big updates for both of them. I first released Goldenbook in 2003 in three weights—Light, Regular, and Bold. It was based on the logo of the 1930s literary magazine The Golden Book. Over the years, I’ve made improvements to the fonts and added more language support, but this is the first major update. 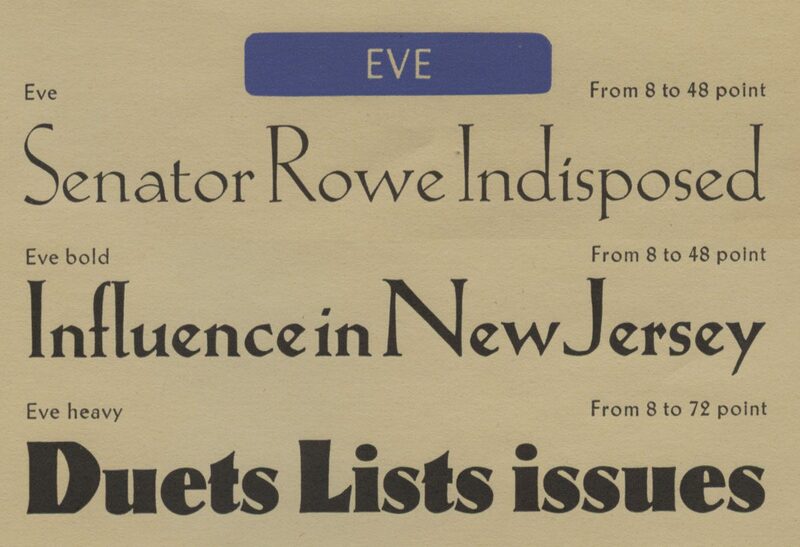 Eve Heavy was the inspiration for adding an ultra-bold weight to Goldenbook. The three weights I did originally were all fairly light. But I’d long thought about going super bold with it, the way Klingspor did with Eve Heavy. It was really fun to see how bold I could go with it. I initially considered raising the x-height as it got bolder, as Klingspor did. This trick works especially well for low contrast designs, like sans serifs, but Goldenbook has enough contrast that I found I could get away with keeping the x-height the same across the weights. The result is three new styles—Extrabold, Heavy, and Black. Adding new weights to Goldenbook was not on my to do list. It was something that’d been on my back burner forever, like a lot of things. But I got an email back in December asking whether Goldenbook supported Cyrillic. I had to say no, but the wheels in my brain started turning and the next thing I knew, I was adding Cyrillic to Goldenbook. Once I got going, I figured I might as well do the bold weights while I’m at it. I had a pretty good idea what I thought the Cyrillic should look like, but I’m not Russian, so I got help from someone who is, type designer Ilya Ruderman. Ilya critiqued my designs and pointed out things I never would have noticed (and a few I should have). Thanks to him, I feel confident that Goldenbook will find an audience among Cyrillic users. And it looks super cool. I made many other improvements to Goldenbook, like extending language support to add things like the acute IJ/ij for Dutch and the controversial capital sharp S for German. I also added an alternate long-tailed R (a user request), a more traditional-style alternate ampersand, a full set of “f” ligatures, and the historical ct and st ligatures, and long s.
Refrigerator Deluxe began life in 1988, one of my earliest attempts to make a digital font. I’ve updated it, added new features, and expanded the number of styles over the years, but this new version is a complete overhaul. Like Goldenbook, this new version started from a user request to add Cyrillic, but I took the opportunity to make other changes, such as adding a new weight, Extrabold, between Bold and Heavy. Given that I’d started Refrigerator when I was just a beginner at making digital fonts, there were some weird things about the way I constructed it, things I would never do today. So I went through, character by character, and fixed all of it, making optical adjustments and other tweaks to bring it up to my current standards. Most of these changes are subtle and you might never notice, but overall it should be much nicer to work with, and I tried to minimize the impact they might have on existing documents if you are upgrading from the older version. Ilya helped me out on adding Cyrillic to Refrigerator Deluxe as well. Just like the Latin characters, the Cyrillic includes numerous alternate characters to change that you can use to change look and feel of the font to your taste. Like Goldenbook, I extended language support, adding things like the acute IJ/ij for Dutch and capital sharp S for German. I also redesigned the diacriticals (accents) and many other characters outside the core alphanumerics. Goldenbook 2.0 and Refrigerator Deluxe 2.0 started rolling out to my distributors yesterday, and some of them (Fontspring 1, 2, MyFonts 1, 2, and YouWorkForThem 1, 2) have already made them available. If you previously purchased a license for any of the existing styles of Goldenbook or Refrigerator Deluxe, you can get a free update for those styles. Check with the place you got the license from to find out how to get it. For more information, including PDF specimens and licensing info, see the pages for Goldenbook and Refrigerator Deluxe.